Putting a Boeing exec at the helm of the ailing automaker is a risky move, says Fortune's Alex Taylor. NEW YORK (Fortune) -- The news that Bill Ford is stepping down as CEO of the company his great-grandfather founded is not surprising. Ford has been searching for someone to run the world's third largest automaker for more than a year and has publicly confessed that at times he felt overwhelmed by the job. That he has gone outside the auto industry to find someone to replace him is surprising. The car business is enormously complicated and tends to be populated by engineers and sales types with gasoline in their veins who have worked in the industry for decades. They are known as "car guys" and they tend to look down upon - if not actively snub - those who find themselves working in the industry without the appropriate appreciation for its culture and byways. Alan Mulally will be coming to Ford from outside the auto industry. Bill Ford will remain chairman at the troubled automaker as Alan Mulally takes over as CEO. So Alan Mulally, 61, most recently executive vice president of Boeing (Charts), will take office as president and CEO with one strike against him. He will neither have a reservoir of industry knowledge to fall back upon nor the immediate support of Ford's tens of thousands of employees. He will be granted a grace period of three to six months, but his every move will be scrutinized to see if he understands what makes the 103-year old company tick. Then there is strike two. Ford Motor (Charts) is not only a company in crisis but a company that is in the midst of its third turnaround plan in the last five years. Sales are slipping drastically and an investment banker has been hired to sell off pieces of the company. There has been unusual management turnover and the current team, which is intent on doing things its own way, has been in place for just about one year. Mulally's arrival means more upheaval and potentially another redrawing of future plans - dangerous steps in a business where the lead time on new products is three to four years. 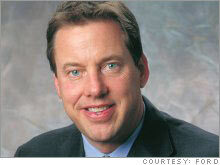 Ford is still suffering from the after-effects of former CEO Jac Nasser's tenure, which ended five years ago. As if that were not enough, Mulally faces all the normal problems an outsider would feel coming in to a big family-controlled company. He will have to deal with ambitious princes like Mark Fields, head of North American operations, who probably thought the CEO's job would be his in a few years. And he will have to deal with the Ford family, which controls more than 40 percent of the company's voting stock and has a short fuse when it comes to professional managers who try to run their family business. 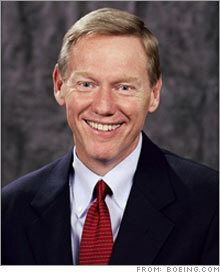 In Ford's press release, Mulally is credited with turning around Boeing's commercial airplane division. Maybe so. The turnaround with new airplanes has been impressive and Mulally has been on the scene. But he was also there in the late 1990s when Boeing got its clock cleaned by Airbus. Which Mulally did Ford get? So what is Mulally doing at Ford? Did Bill Ford, after being turned down by Nissan's Carlos Ghosn and Daimler's Dieter Zetsche, decide he didn't want to be embarrassed by another refusal? Or did he scour the rest of the industry, suppliers and manufacturers included, and come up with empty hands? Mulally is a bold and risky choice for the top job at Ford Motor. Shareholders can only hope that Bill Ford has made better pick to run his team than he has in his other family enterprise: the hapless Detroit Lions football team.